This tastes very similar to a restaurant that is known for their delicious pies. I personally think this recipe tastes a lot like Marie Callendars Potato Cheddar Cheese Soup, but that is just my opinion! 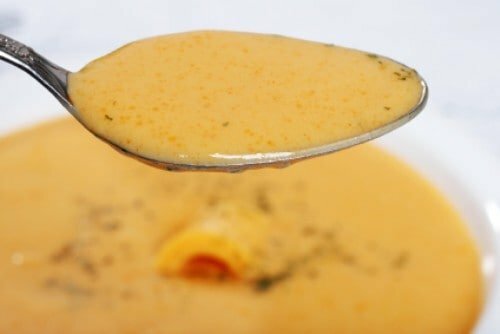 Love cheese soup recipe? Be sure to check out these recipes where cheese if featured. This Restaurant Style Cream of Potato Cheddar Cheese Soup takes much like the one served at Marie Callendar's in our opinion. On medium-low heat in a 3-quart saucepan saute celery and onions with butter. Cook until onions and Celery are clear take care not to let onions brown. Add chicken broth, potatoes, and water. Place on medium-low heat and cook until potatoes are very soft and tender. When potatoes are done add chicken bouillon cubes and cook until cubes have been dissolved. Mash the potatoes slightly but leaving most of them in chunks. Reduce heat and add half and half, stir the mixture. Add shredded sharp cheddar cheese and stir until cheese is completely melted and dissolved into the mixture. Sprinkle sugar, pepper, and salt into soup, stir. Let soup simmer very slowly for 20 - 30 minutes taking care not to let soup scorch. When ready to serve garnish with shredded Colby cheese, jack cheese and maybe a little parsley. Add a crisp salad and hard rolls and you have a wonderful meal. This soup is sooo delicious! Everytime I’ve made it, it’s been gobbled up. No leftovers. Definitely the best potato soup I’ve ever had, and simple to make. I served this at a baby shower, everyone loved it! Love this soup! I did add extra cheese just to make it cheesier!